As far as I know, here are the active web cams in Venice at the moment. Let me know if you find others. At the time of this shot, Carnevale was in full swing and the Piazza was jammed with revelers. This cam looks especially cool at night. If this cam goes back online, please leave me a comment and I will update the list. 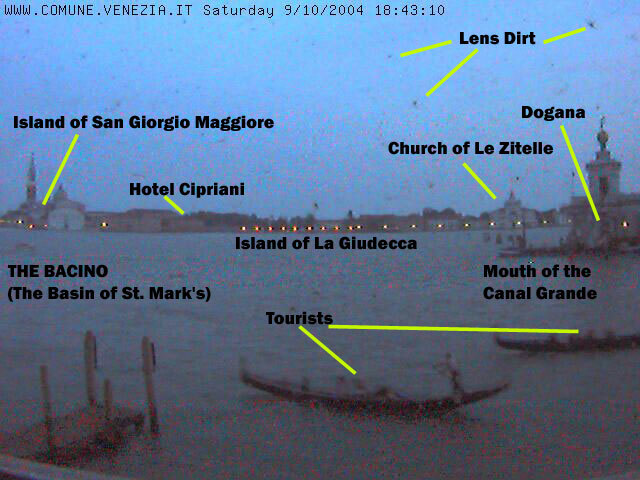 This cam looks toward the harbor (Molo) with the island of San Giorgio Maggiore in the distance. You can see the Basilica and Doge's Palace on the left, the Sansovino loggia at the base of the Campanile on the right. In the distance on the right, you can also see the buildings that comprise the Biblioteca Marciana (also a Sansovino masterpiece) and the Zecca, the old Venetian mint. 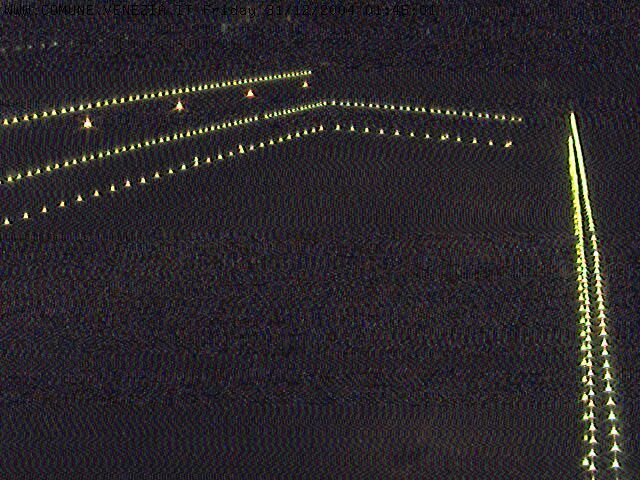 This cam looks incredible, 24/7, but is especially magical at night. It's not much to look at at night (when I grabbed this shot), and is blinded by the sun at other times of day, nonetheless, this cam is pretty cool the rest of the time. It's also perched atop the clock tower in the Piazza, and is pointed at Ala Napoleonica, the part of Piazza San Marco that is opposite the Basilica (home to the Correr Museum). With these first three cams, you can pretty much monitor the entire Piazza. 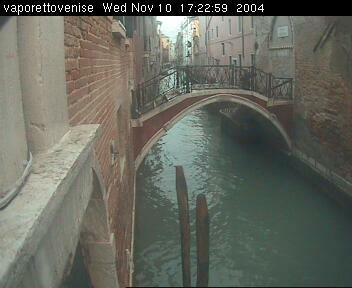 This cam looks down at the San Toma' vaporetto stop. Highly detailed, large (640 x 480) image. You're looking toward the Rialto. Virtually useless after dark. It's lit at night, so this is a 24/7 view. Every now and again, a gondola slips by. 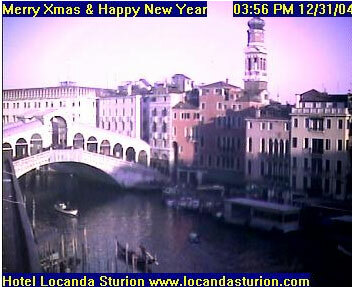 Overlooking the Rialto Bridge from the hotel Locanda Sturion. Theoretically, I guess, you could follow a boat's progress from the from the Rialto to the San Toma' vaporetto stop then to the Bacino (see below), or vice versa. But then again, you probably have a life. 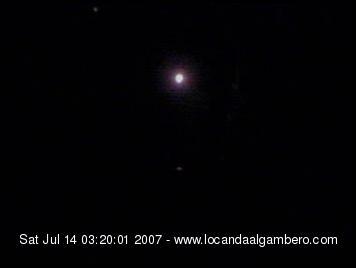 This is a low res-cam, too, and seems to update every two minutes or so. This one cropped up in October 2004. It looks over the Bacino (the Basin of St. Mark's) as seen from Ca Giustinian on the San Marco side of the Canal Grande. You can see the island of San Giorgio with its campanile and Palladian jewel of a church. There's another Palladian church on the right, Le Zitelle, perched on the island of La Giudecca, my former home. The ex-customs house, La Dogana can be seen in the center right. A cool thing: this cam updates extremely fast ... about every second. So lean on the refresh button. Thanks to Marisa, who helped me ID the location of this bridge. Other cams pop up. There once was a street-level cam (which I prefer) in an Internet service bureau on a calle that led into Campo Santa Maria Formosa. I used to point my webcam out the window of the Accademia dei Nobili from time to time to amuse people I was webchatting with over CUSeeMe. Yes, I stumbled across the site while looking for info on the convent at Guidecca. I'm really searching for the cheapest possible accomodation for a trip I'm planning in the next couple of months. This site is SO useful that I'll be back for more, no doubt, and recommending it. Love the webcams too. Not sure what you mean. Veniceblog provides links to webcams that other people/organizations host. So I have no way of "cleaning up" a web cam, as such. I'm over 5,000 miles away from the camera. Thanks again, I might also need some information on tidal progression in Venice, if you have any, please feel free to send me some links. Also, never go to B&B Rota if you're planning to find a good place to stay, it's the worst place ever, and they tried to cheat our money. no way to be sure about the floods... december is sometimes worse, sometimes not. two good ways from airport ... bus to piazzale roma ... cheap ... take a vaporetto from there to your destination. 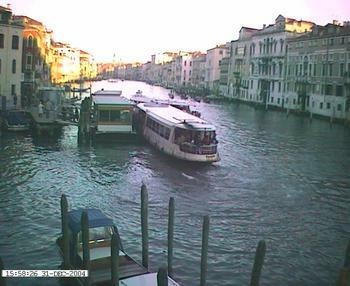 Or look for a large boat to Piazza San Marco ... these run frequently during normal hours. Water Taxi is best at roughly $80-90 .. door to door. Just discovered this site and love it! Thought I'd mention (for any who don't already know it) that, on the "Grand Canal, from Palazzo Balbi" webcam, there is a traghetto run right behind the San Toma vaporetto stop so you fairly often see a gondola crossing the canal. That's right ... I'd forgotten that. I've taken the traghetto there many times. it's great this site.I booked a trip to Venice between 4-7 of february and I'd like to know where is the best place to start to visit. I have the accomodation in Mestre. I'd also like to know if it worst to buy venice card eighter blue or orange considering that I'm a jurnalist and I have a press ID. We are going to be in Venice Easter weekend. Are there any churches which would be particularly 'good' during this time...any processions or other celebrations of note? I'm so pleased to have found this site! Can you, or anyone, advise me how to find out what's on at the Fenice and, more importantly, how to book? I can find the Fenice, but no info about productions. looking for a place to stay in venice in september that isn't expensive, anyone have any recommendations. of venice is the 25th March. If true I share my birthday with one hell of a place. It's said that the date of Venice's founding was March 25, 458. But there are no written histories from that era (or for centuries after that). But Venetians love their lore! Regardless, there's at least a 1 out of 365 chance it's true. but I would like to taste "real"
pasta meals,without spending an arm and the odd leg. Please help me. Made reservation for B&B Rota thru Hostelworld.com. I'm looking for an email for this B&B and can't seem to find one. Is this a good place for the teens to stay? i booked B&B rota through hostelworld.com too. and i emailed them with some questions at lucianorota@hotmail.com (which hostelworld provided me with) but have not yet to hear from them for a week. anyway is B&B rota ok? because i have read such mixed reviews on it. some raving about it while others totally dissing and advising everyone to steer clear of it. i am rather confused and worried now. My fiancee and I are planning to elope in Venice in August. 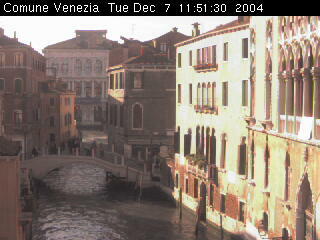 We've been told there is a webcam at the place the civil ceremonies are held -- Palazzo Cavilli. I am searching to try to find the webcam so I can watch a ceremony. If you have any knowledge of this please email! A negitive comment in regard to B&B Rota, Venetizia, Italy just attracted me to your web site. I would like to add my comments also if that is possable. Would I stay at this location again: no way! After having previously stayed at this property three years ago we were extremely disappointed this time. The so called "bed and breaky", is no more now than a poor quality hostel and no longer deserves a high rating with hostelworld.com. We stayed in our overly hot room for eight days. In this time our bed was never made or changed. We had to beg for a clean towel each, and the bin lid was extremely grotty as was the lower shower edges. The bedrooms no longer have large beds or furniture, not even a place on which to place your case. No one glass or cup was provided in our room from which we could drink. Breakfast was a stale over dried out croissant and one only cup of coffee provided at the cafe below. No guests were allowed to choose from the current day’s display of pastries. The kitchen was skimp of crockery, glasses and cups. The stove was quite likely unsafe and difficult to light. No lighter was provided and when asked for assistance the manager answered, without turning front on. He informed me that didn't know how to light the stove, nor did he know if the stove in fact worked. It was made quite clear, in a most rude manner that he had no interest in assisting anyone in anyway. I found it difficult to believe this person is the manager and is in fact Italian. He had no respect for his guests at all! I would not recommend this hostel to anyone again. It completely spoiled our visit to Venice. Three years ago we had left this property recommending it to other travellers....how times have changed with new management! Sincerely, Francine and Giuseppe Rizza, Australia. Email address provided. They claim to have won awards for their accommodation! We paid $160.00 Australian dollars per night to stay at this dreadful place! It seems to me this place has earned it's unfortunate reputation. The pictures shown of this slum are relivent to 2002. Very pretty, not at all how it is in 2005! In the past, I would book very inexpensive hotels through Alitalia but I have since become more savvy. My favorite website to book my hotel is www.aaahotels.net. The discounts are great and I stayed in wonderful hotels for half the price. My favorite is the Kette--wonderful staff and location. Booking early is always essential to availability but I haven't been disappointed,yet. There, my secret is out--I hope it will still be available to me. Happy hotel hunting. 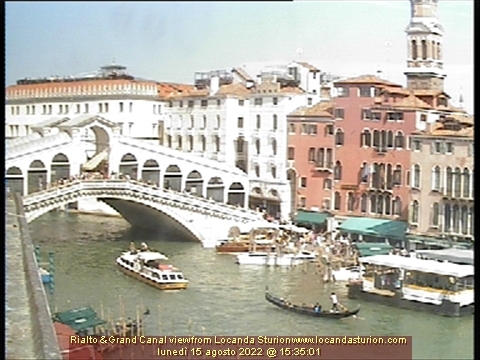 Hi ,my mum & dad always loved venice , at one point i think they visited 3 years in a row x2 a year!! !3 yrs ago my dad was dying of lung cancer ,when mum we asked my dad where he wanted his ashes scattered he chose venice.we took him to the public park(giardini) which is about 15 min walk from st marks( to the right as you depart the ferry)it was incredibly moving as every time he holidayed in lido etc he & mum would promise themselves that they would visit the park but never did.anyway ,mum& i eventually cleard out what was left of his bank account & took us & his grandchildren to the park in venice.we walked past all the biz in the main centre,out to the quiet normality of the residential area next to the garden .it was not unlike a glasow tenament with washing hanging out on lines .real authentic area that my dad would have loved & scatterd his remains around the fountain &statue of garibaldi .we sat & had a quiet moment.it was a beautiful day in may & we noticed a sign in italian at the railings.when we returned to the hotel in lido ,the owner was good enough to translate the sign as we had explained the purpose of our visit to him .as her read the napkin on which we had written the words from the sign he began to smirk, then grin and finally laughed out loud .he explained that the sign was a warning not to litter the park!!!!!! i would recommend you depart the ferry & walk minutes along the front till you get to the garden .it is peaceful,incredibly quiet apart from local kids playing games & women shouting at them for getting the washing dity. careful you dont litter tho!! Hello. I was in Venice recently and I loved it!!! I was all over Italy infact, but Venice was my absolute favorite!!! While i was there I tried to get a picture of the UPS boat that comes in but i missed it. Does anyone happen to have a picture they'd be willing to share? 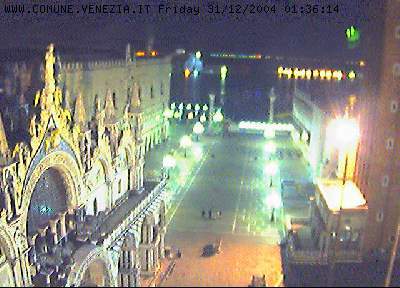 It seems like the website for the city of Venice removed their webcams. 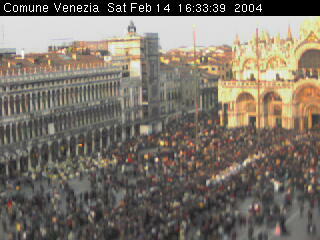 Any suggestions on where to go to get the webcams in Piazza San Marco? Word is that the site was hacked and that's what shut it down. Have not confirmed it, though. I've check other websites with access to the same webcams and those are also down. The only views available are the Rialto Bridge and view from the S.Toma vaporetto stop. How disappointing. there is a streaming video on the Ca Maria Adele hotel website. Norman: Your 360 of the Piazza San Marco is fabulous. But the camera does lie. Somehow all the detritus of 24/7/365 wear and tear has disappeared and been replaced by this glowing romanticized vision. Thank you for a great photo! Since the Piazza webcam has been unavailable for a while I am surprised to see that the construction walls around the Clocktower have been removed. Could it be that the work on the Clocktower has been completed? Actually, I must have gotten there after the cleaning crew, because (unlike I often do) I didn't retouch any garbage out. The clock is due to be finished soon. Let me look into it. Perhaps the blessed event has occured at last.